Everyone wishes to have a long lasting marriage. But when things are not working, you should know what to do to end the marriage legally. In Indonesia, divorce and marital dissolution have been governed by the 1974 Marriage Act and its implementation rules. DeathThe death to either party will automatically terminate the marriage. 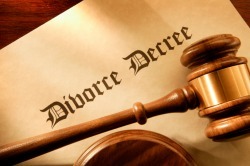 DivorceOne of the means to dissolve a marriage is by divorce. Divorce may only be executed before a court session, before the district court for Non-Moslems and before the religious court for Moslems. Therefore, either one of the parties wanting to divorce needs to file a divorce petition to the court. Upon Court's Decision: AnnulmentMarriage annulment means that any marriage may be cancelled if both parties cannot fulfill the conditions for the marriage. A marriage annulment can only be decided by a court of law. Families in a straight line of descent and above the husband or wife (For example: father, mother, grandfather etc of husband or wife.) , an authorized/appointed official, and anyone directly possessing legal interest in the marriage may file a request for marriage annulment. the marriage was not attended by two witnesses. The marriage was performed in front of unauthorized marriage registrar. The right to annul a marriage by a husband or wife based on such reasons becomes null and void if they live together as a married couple and can show the marriage certificate issued by the unauthorized officer of the marriage registry. In this instance the marriage has to be conducted again in order to make it legal. The husband or wife may request an annulment of their marriage, if the marriage was conducted before an unauthorized officer of a marriage registry, or if the marriage was conducted under a threat that violates the law, or if there is a misunderstanding between the husband and wife. His/her right will be null and void if the threat has stopped or if the misunderstood party? realizes the situation, but doesn't use his/her right to request for marriage annulment within six (6) months after living together as married couple. Example of a “misunderstood condition” would be if the husband thought the wife was a virgin, but in fact she was not – so I misunderstood about her personal conditions. husband or wife acting with good intention, except against joint property, if the annulment is based on a previous marriage. The annulment decision is retroactively effective to the joint property of the parties in the event the marriage was entered and one of the couples was not legally free to marry. a third party, so long as he/she has the rights based on good faith. When a husband or wife passes away, their marriage is automatically terminated. When a wife passes away, her husband doesn't have any legal difficulties in marrying another woman, but can remarry immediately. But, when a husband passes away, his wife has to wait for four (4) months and 10 days before she can marry another man. Literally, thalak means to release (abandon). Thalak or divorce is the right given to a man and is an action of releasing a woman from the marriage. In Islam, this method of divorce has been stipulated, but it is accompanied by the explanation from the Prophet Mohammad that God doesn't like divorce. Divorce through a judge's decision may be due to several reasons, such as, among others, that the husband is unable to provide the basic necessities of life, the husband commits torture against his wife, the husband vanishes (being far away from or not being near his wife), or that the husband is serving a term in prison. Fasakh is the cancellation of marriage agreement (akad) and the termination of a marriage between a husband and wife due to damage taking place in the marriage agreement (akad) or due to sudden reasons that may hamper the continuation of the marriage agreement (akad). For instance, it could be due to a problem in the family relationships. Fasakh will cause the marriage agreement (akad) to be annulled. Khulu' is a divorce given by a husband to his wife with payment to the wife. Khulu's is required by Islam for balancing the thalak right for a husband when there is a hatred that cannot be settled peacefully. A marriage may be terminated due to li'an, because the person making the li'an in the fith oath says that God's curse is upon him/herself if he/she is a liar. As a result of li'an, the marriage is terminated forever. If the accusing husband denies the birth of a child by saying that the child is not his, the child is not the offspring of this husband any longer, but legally becomes an illegitimate child and becomes the child of accused wife. The child cannot inherit from his/her father (the accusing husband). If the child is female, her guardian is a judge of justice, if the child will marry someone else. Murtad (apostate) is when a Moslem abandons Islam. If a husband or wife is judged apostate, their marriage is terminated due to their action. Marriage dissolution based on the grounds of thalak, li’an, and khuluk’ shall only valid in the event they are conducted at the religious court. Marriage annulment is also known as fasakh is the cancellation of marriage agreement (akad) and the termination of a marriage between a husband and wife due to defect taking place in the marriage agreement (akad) or due to sudden reasons that may hamper the continuation of the marriage agreement (akad). For instance, it could be due to a problem in the family relationships. Fasakh will cause the marriage agreement (akad) to be annulled. Annulment petition can be filed at the local religious court having jurisdiction over the residence of husband or wife or may be submitted to the local religious court within the jurisdiction where the marriage was conducted. Court decree on marriage annulment shall take effect retroactively since the date of marriage took place. Other parties who aware of any marriage defect in terms of marriage requirements as imposed by the prevailing law. Disclaimer: The above is provided for informational purposes only and is NOT to be relied upon as legal advice. This information is not a substitute for the advice of an attorney and should not be construed as a solicitation. No attorney-client relationship is established by use of information found anywhere in this article nor in this website.